Residential and commercial buildings account for around 40% of the total energy consumption  and heating systems in buildings represent more than half of this amount . However, a large amount of energy is wasted due to bad control strategies currently implemented in office buildings. Usually, rule-based controllers are implemented and, as the name suggests, they are based on simple handcrafted rules that do not take into account many factors. An example of this rule could be “turn on the heating system if the indoor temperature is below a certain threshold” or “reduce the heating power around noon”. Since buildings are affected by many external disturbances such as outdoor temperature, solar irradiation, occupancy of the building, etc, it is easy to see how, while the rule-based controller might achieve acceptable performances, it will most likely result in a waste of money and primary energy sources such as natural gas. In this regard, researchers have studied different solutions such as Model Predictive Control (MPC) applied to building heating systems [3-6]. To keep it simple, the idea behind MPC, as explained in my previous article, is to transform a control problem into an optimization one, including all the necessary constraints directly in the optimization problem and a cost function to be minimized. In the case of a building heating system, constraints can include the maximum and minimum power of the heating devices, the maximum and minimum room temperature, while the cost function can be set according to the needs, for example reducing the economic costs, the discomfort of occupants, the CO2 emissions, etc. The other nice feature of MPC for this kind of application is that it is possible to include in the control problem formulation the external disturbances that we mentioned before, so that we can look at what will happen in the future and take some control actions accordingly. However, while applying a standard MPC action instead of rule-based control algorithm to a building heating problem can lead to energy savings , more advanced techniques can be applied to the controlled system. In fact, due to the presence of many different disturbances that act into the system, a standard MPC controller might not be the best choice in terms of performance. Indeed, standard MPC will take only one forecast for each different disturbance and assume that it has no errors. Instead, the forecasted disturbances can be quite different from the actual disturbance, leading to some performance losses. In order to improve the efficiency of our controller, we have to look at MPC strategies that include in the MPC formulation the presence of disturbances. We mainly have two options available: robust MPC and stochastic MPC. Robust MPC will try to satisfy all the constraints of our problem for every possible realization of the disturbance but, in a case such that building heating, it will be overly conservative . In fact, robust MPC will try to keep the room temperature within the comfort bounds at all times, thus leading to a high electricity or gas consumption. On the other hand, stochastic MPC solutions will allow the temperature room to temporarily violate the comfort bounds, leading to a more relaxed control action, which still provides good performances. In fact, in the case of a building heating problem, it is not crucial to satisfy the comfort bound at all times, as long as the violation does not last too long in time. Among the different stochastic MPC techniques, we focus on Scenario-based MPC. The main idea behind this strategy is to generate several scenarios of the external disturbances and optimize the inputs of the system for all these scenarios and therefore for the possible evolutions of the system. This strategy is very suitable when a nonlinear model of the system is used and when the information about the disturbances acting into the system is purely empirical, as it is in our case. Moreover, when including several scenarios, we can take into account different possible evolutions of the disturbances: for instance, one scenario could tell us that the outdoor temperature will be lower than what we expect and thus we could be more prepared to face such disturbance, or in some scenarios it could be more or less sunny. By computing a common control action for all these scenarios, we are able to react to a wide range of external disturbances. In our work, we focus on an application of scenario-based MPC in a building heating system, in collaboration with 3E. We use a greybox model of the system obtained through Modelica, which allows us to have a very detailed model. For the scenario generation algorithm, we use the method presented in , which allows to generate statistically meaningful scenarios. For more details on scenario generation techniques and forecasting, we refer to Jesus’ article. Fig. 2. 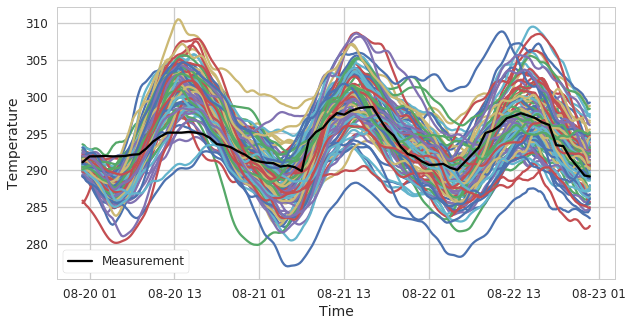 100 outdoor temperature scenarios generated with the model proposed in . The measurement is shown in black. European environment agency. Final energy consumption by sector and fuel. https://www.eea.europa.eu/data-and-maps/indicators/final-energy-consumption-by-sector-9/assessment-1, 2016. A. Parisio, M. Molinari, D. Varagnolo, and K. H. Johansson. 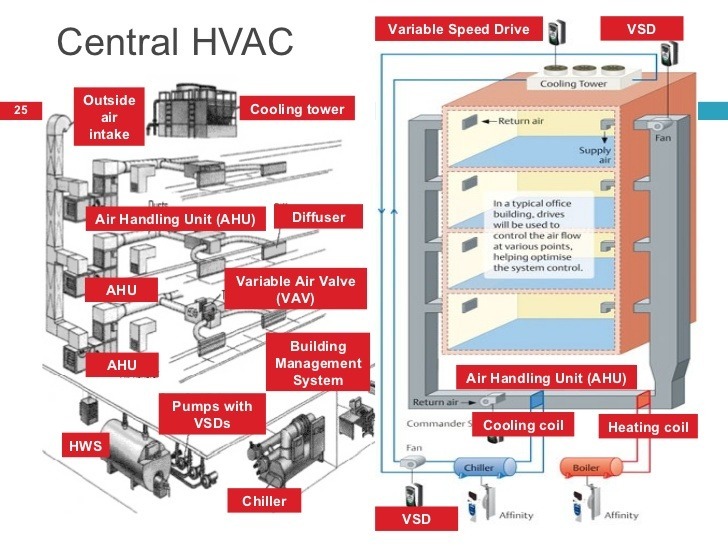 A scenario-based predictive control approach to building HVAC management systems. In 2013 IEEE International Conference on Automation Science and Engineering (CASE), pages 428–435, 2013. F. Oldewurtel, A. Parisio, C. N. Jones, D. Gyalistras, M. Gwerder, V. Stauch, B. Lehmann, and M. Morari. Use of model predictive control and weather forecasts for energy efficient building climate control. Energy and Buildings, 45:15–27, 2012. Y. Long, S. Liu, L. Xie 1, and K. H. Johansson. A scenario based distributed stochastic MPC for building temperature regulation. In 2014 IEEE International Conference on Automation Science and Engineering (CASE), pages 1091–1096, 2014. A. Parisio, D. Varagnolo, D. Risberg, G. Pattarello, M. Molinari, and K. H. Johansson. Randomized model predictive control for HVAC systems. In Proceedings of the 5th ACM Workshop on Embedded Systems For Energy-Efficient Buildings, BuildSys’13, pages 19:1–19:8. ACM, 2013. R. De Coninck and L. Helsen. Practical implementation and evaluation of model predictive control for an office building in brussels. Energy and Buildings, 111:290–298, 2016. M. Farina, L. Giulioni, and R. Scattolini. Stochastic linear model predictive control with chance constraints – a review. Journal of Process Control, 44:53–67, 2016. Pinson, P., Madsen, H., Nielsen, H. A., Papaefthymiou, G., & Klöckl, B. (2009). From probabilistic forecasts to statistical scenarios of short‐term wind power production. Wind energy, 12(1), 51-62.